Hello! I hope you had a wonderful weekend! Now that our vendor show is over, I can get back to stamping : ) I made this card for today's Technique Lover's Challenge on SCS. We were supposed to cut something out of embossed paper, patterned paper, or a stamped image. I found this embossed Anna Griffin paper that I have had for like 9 years, so I decided to cut out this vine/leaves portion. 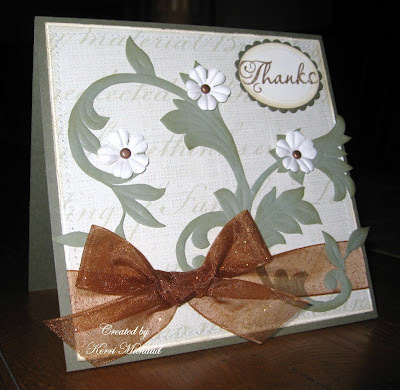 I added Prima flowers with copper brad centers, and this pretty copper ribbon. I distressed the edges of the panels with the Tim Holtz distresser tool, and sponged them with Ranger Antique Linen. The sentiment was stamped with ColorBox Bronze and distressed as well. I used Oval Nestabilities to cut it out and pop it up in the corner. I also added a straight stitch around the perimeter, but it didn't show up very well. Thank you so much for stopping by today! Love it! I really like the ribbon you chose to use. Very pretty! Really pretty, Kerri. Lots of neat techniques on this card! You cut that out? You're crazy! LOL I love the look of this card though - clean and elegant. PS - check your mail at SCS! Very very elegant! I love the flourishes, flowres, and that wonderful bow too! What a wondeful color combo and a very very beautiful card! !